We've seen the Canon RF 28-70mm f/2 L USM described as offering four prime lenses in one, and after using it for an extended period of time, we'd certainly agree with that assessment. Whether using it as 28mm, 35mm, 50mm or 70mm, it delivers tack-sharp images both in the centre and at the edges of the frame, with no need to stop down to get acceptable results. That means that you can shoot at f/2 at any focal length and get buttery-smooth bokeh as a result of the 9-blade aperture and that maximum aperture that is one-stop faster than most zooms of this type. Slight vignetting at wide-open apertures and a little barrel distortion at 28mm are the only real optical issues of note from what is optically an incredible lenses. Of course, combining four quality lenses into one inevitably makes this single lens very big and heavy - there's no getting away from the fact that using the Canon RF 28-70mm f/2 L USM for extended periods of time can prove tiring. It also feels a little unbalanced and front heavy on the EOS R camera, which is currently the biggest, most pro-level body that Canon currently offer. 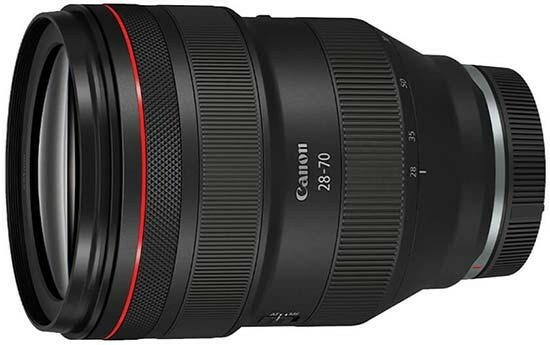 The Canon RF 28-70mm f/2 L USM would certainly be more at home on a larger camera body than the EOS R.
Build quality is excellent, certainly up to the usual L-lens standard, with the built-in weather-proofing offering peace of mind in more inclement conditions. Given the price, though, we'd have liked to have seen a better case included in the box, rather than the standard soft pouch. Auto-focusing was quick, quiet and reliable on the Canon EOS R camera body that we tested the lens with, while manual focus over-ride at any time is a great feature. The new Lens Control Ring takes a little getting used to, but soon becomes quite a handy feature to have. We did miss having any form of image stabilisation when using this lens with the EOS R in low-light, as neither this lens or particular camera body offer it. Ultimately whether you think the asking price of £3079.99 / $2999.99 for this lens is acceptable or not comes down to how you intend to use it and how many other lenses it could effectively replace in your kit. Pro photographers looking for the ultimate in speed and image quality need look no further. More casual shooters who primarily value portability and cost should look at the RF 24-105mm f/4, which is an excellent lens in its own right. But if you want to be blown away by what Canon are capable of delivering via their new EOS R full-frame system, then look no further than the incredible Canon RF 28-70mm f/2 L USM lens.